KITsubs: Kamen Rider Episode 08! After a long delay, we're finally back with new episodes. Sorry for that, again! Hopefully, we should be back on track... which should be obvious from the Project Status bar on the right! 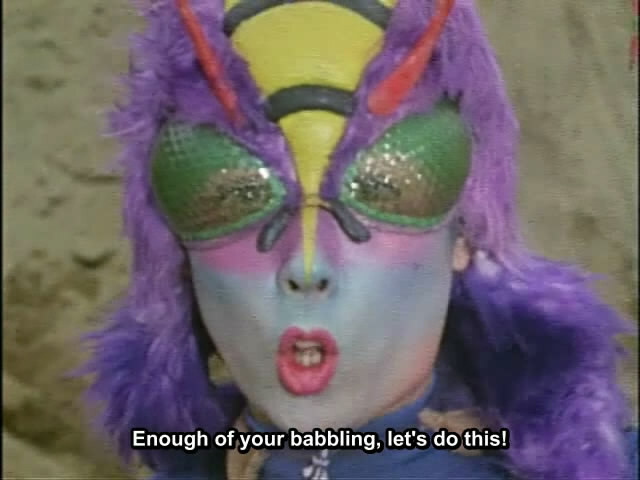 In this episode, BeeWoman (who was recently re-imagined in the Kamen Rider Decade and W movie!) makes her debut appearance, and she is one nasty lady! Witness a needlessly convoluted Shocker plot unfold, followed by one of the most brutal Rider Kicks that I can remember in the older shows. Ouch! Again, please take some time to give a great big thank you to the team. UK Windom, Sky79, and Sjutton. They all put in a TON of work to get these episodes out. If you have a chance, drop in and say thanks on the forum. And keep an eye out for our secret project. I won't spoil the surprise, but I can tell you that we'll have a new option for enjoying these episodes aside from our usual downloads. And they're short, but sweet. Ok, maybe I gave too much away... The first release will be this week, along with Skyrider 08, so keep your eyes on the blog, and our twitter! You lads rock for doing this overall! If we've waited over twenty years to see the original Kamen rider in English, waiting a few more hours won't kill us. :-) Keep up the good work! What the...Bee Woman has a male stuntman. You can clearly see his package when he's fencing Hongo. Awesome stuff fellas. As a newish Kamen Rider fan living in the UK, (where pretty much our only major exposure to KR was that damn Ferbus and Friends show) it wonderful to be able to see where the series began. Thank you so much for all your hard work. Thank you so much! Now I can watch ep 8! most of the series of Cybercop are in Spanish sub or RAW.so can you guys subbed it in ENG?